With E.J. off at Annual Training for the next 2 weeks, I am taking the opportunity to inventory my freezer this week so that I can do a massive defrosting next weekend. We actually have 2 freezers, and the large one in the laundry room is not the kind that is frostless, so about twice a year, you have to go old school and pull everything out to thaw out the massive ice buildup. While the project is always a massive pain, it’s a good opportunity to go through everything and throw out things that are too freezer burned, or otherwise undesirable to make room for the good stuff. In order to minimize the amount of ice and ice chest space I need, I’m trying to “Iron Chef” it this week with whatever I can find. On Friday, I did a version of these Paleo Enchiladas using some frozen pulled pork for the meat and some Siete tortillas. 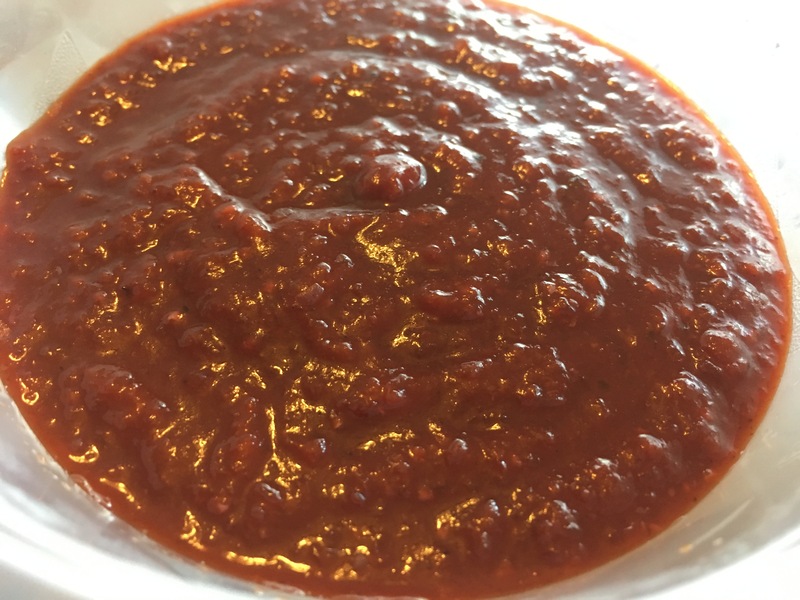 The sauce was actually delicious, and I would like to try this full recipe someday. Then on Saturday, I did I wanted to use the last of the cherries I had in the fridge and some beef and pork , so I made this Meatballs with Cherry Sauce dish. Mom and Brendon really liked that one. Last night, I pulled out an old favorite to use up some frozen salmon. This one is always a winner. And tonight I used up a couple of lbs of shrimp by sauteing them with onions and bell peppers in a Jamaican jerk rub with butter. It was a little spicier than I had intended, but otherwise really good. I’m about to go diving back into the freezer to figure out what we’re going to have tomorrow night…. your guess is as good as mine! Our good friends Kenny & Elaine got a new smoker recently and were gracious enough to share their first bounty with us – some lovely smoked brisket. As I was gathering produce for the side dishes I planned to make to accompany it, I couldn’t help grabbing another bag of fresh sweet cherries. I know they won’t be in season for much longer, and I really enjoyed the chicken recipe this week for lunches. I came across this recipe from The Joyful Foodie, and used it as a starting point. The rest was inspired by an awesome cherry chipotle rub that E.J. and I used to use before we went Paleo. Enjoy! Let the mixture cool, and then transfer to a blender. Blend until smooth. It’s hot out there, guys. Generally speaking, this is my least favorite time of the year, mostly because from mid-July to mid-September, Houston is pretty much a sweltering, sweat-inducing, swamp of a city. While most Americans hibernate during cold winter months, we hibernate in the summer, running from A/C blasted cars to frigidly cold A/C buildings and trying not to sweat completely through whatever we’re wearing in between. The only positive thing that comes around this time of year is an abundance of fresh and flavorful fruits – and while fruit should generally be enjoyed in moderation on a Paleo diet, there are lots of ways to incorporate the flavors into your main dishes to make them a little brighter without any additional sugars added. This week, I made 2 dishes that used fresh fruits that were calling my name. The first was a Cherry Balsamic Roasted Chicken. For this recipe, I used boneless skinless breasts and thighs in a large Pyrex dish, just so I could make a bigger batch. It was actually one of the easiest dishes I’ve put together and I’m looking forward to trying it for lunches this week. The second one came across as a suggested post on my Facebook last week, and I have to admit to being insanely curious – who ever heard of blueberry sausage? But Blueberry Breakfast Muffins were paired with some grilled summer squash this week for a hearty meatball/loaf lunch option. While I had the smoker going with some ribs that were on sale, I also made this Sausage Egg Roll in a Bowl recipe, and just heard back from E.J. that it was a hit. So even if it’s too hot to enjoy the weather, at least we can enjoy some summer flavors! If you recall a previous post several months ago, I really messed up my right knee right after we got back from vacation in March. It had already been bothering me a bit, and then after sitting on the porch one day with Buddy on my lap for an hour or so (putting pressure on my knee cap) I got up and had excruciating pain under my kneecap. I thought at first that it would be temporary, but the pain was persistent and kept me walking with a limp, sometimes to the point where it would just give out while I was trying to walk or come down stairs. Finally after an MRI, I was diagnosed with Runners’ Knee – a common, but nasty condition where the cartilage under the kneecap has worn down and the kneecap keeps moving out of the groove where it’s supposed to be. The only remedy is time and therapy, strengthening the ligaments and muscles around the area and allowing the tissues to recover. I was making great progress with it after a couple of months, and then one day twisted it just right and felt like I was back to square one. The frustration at wanting to run and not being able to is excruciating and infuriating. I have to admit to feeling a range of emotions because of it – depression, anger, and even resignation that I might as well give up the whole diet and exercise thing because if I can’t exercise, the diet has to be really strict for me to maintain my lower weight. It’s really hard to watch the scale creep up when you know how to make it go back down, but can’t physically do it. Fortunately, E.J. and I counsel each other regularly on this journey, so when I hit this roadblock, he hit the Internet, looking for ways to help me “adapt and overcome”. First, he bought me a good exercise bike. Fortunately the bike allowed me to get my heart rate up, and strengthen the muscles around the knee without the damaging impact. I’ve been doing 30 minutes on the bike 3 times a week for the last couple of months to ensure I still get some cardio exercise, but I just don’t get the sense of satisfaction that I get from running. First, it’s hard to stay in the same place going nowhere for 30 minutes, and 2nd, it just doesn’t get my whole body moving like running does. Then most recently, he bought me a new knee brace. I’ve actually tried at least 3 different ones since the initial injury, trying to find one that was flexible enough to move in, stayed in place, supported the kneecap, and breathable enough to wear all day. He found a bunch of people on Reddit who had my same injury who recommended a specific brace and patella strap set that’s only $8 that they swear by. Well, after wearing the brace comfortably for about 2 weeks, I can now officially say it’s the greatest thing since sliced bread. Not only did the pain go away when I walk, I can wear heeled shoes again all day at work, go down stairs without wincing, and this morning, for the first time since March, I went out and did running and power walking intervals for 20 minutes… and I’m walking without pain afterward. I’m so excited to feel like I’m finally getting back to where I want to be physically. Obviously, I need to baby it for the next few days so I don’t overdo it too quickly, but I’m looking forward to trying a few more intervals over the next few weeks on my way back to a 5k. Moral of the story: Don’t let injury, vacation splurges, or anything else get in the way of your long term goals. Accept your situation, whatever it is, and keep trying to find a strategy that works for your specific circumstance… and when it changes, be flexible enough to “adapt and overcome”! This weekend, in addition to E.J.’s 50th, we also celebrated 6 or 7 other summer birthdays with our annual Summer pool party. We had quite a large, diverse group in attendance, and still managed to keep the party very Paleo-friendly while offering tasty summer-season flavors that received a ton of compliments. I was actually feeling a bit under the weather going into the party, but with the help of the A-Team (my awesome friends Annie, Anita, and Amber), we had a fabulous banquet for all to enjoy. Cherry Orange Salsa – Annie also brought this one, and it was a huge hit. It was a departure from the standard chips and salsa and seasonal sweet cherries were fabulous with the jalepenos. We served the salsa with Siete tortilla chips, and people were surprised at how good it was. E.J. and I ended up grilling some pork chops afterward and making a meal of the salsa on the chops for an easy packed lunch this week. Bacon Wrapped Prawns, Stuffed with Jalapeno Cream Cheese and Drenched with Honey – How awesome does this sound? It tastes even better. I know cheese is off-limits for Paleo, but I picked up some lactose-free cream cheese from Whole Foods to help offset the negative effects, and these flew off the plate. For the record, I only used jalepenos and kept the serrano out, but yum! Spicy Salmon Cucumber Bites – I had some cucumbers that needed to be used, and decided to consume them with this easy recipe. Instead of baking the fish, we smoked the salmon first, which was not only yummy, but also pretty with the cute red tomato bits on top. Bacon-Wrapped Pineapple – it doesn’t get any simpler that this folks. Amber brought this one and it was the first dish to be cleared. Hooray for Healthy and Happy Summer Party guests!! For this year’s 4th of July celebration, we kept it simple since next weekend is when we’ll be celebration E.J.’s big 50 with friends and family. We made a few fan favorites and I also tried a couple of new summer dishes, since the crowd was particularly Paleo-friendly. Fortunately, we had a lot of wins, and some of them were in definitely in that “Better than non-paleo” category, which is always what I’m going for. Coconut Fruit Dip – I served this with Strawberries and Blueberries for a red, white, and blue appetizer. I initially tried whipping the coconut cream but quickly realized I ruined it when it started separating in the mixer. I think the key to this is to make sure your cream is very cold if you’re going to whip it. I didn’t have a chilled can, so I just skipped the whipping step and mixed everything together by hand. It was still really tasty and I didn’t have any leftovers. Death By Chocolate Ice Cream – this dish was made on a whim after I ended up with a bunch of egg yolks following another recipe. I used Penzey’s high fat cocoa for the powder, honey for the sweetener (I probably only put in 3 or 4 tablespoons), and added dairy-free mini chocolate chips while it was churning. It ended up being a super dark-chocolate masterpiece, and people were saying this was the best chocolate ice cream they’ve ever had… there weren’t any leftovers of this either. Apple Pie – I wasn’t quite sure about this one, especially since it relies heavily on coconut sugar for all of the sweetness, but I was pleasantly surprised with the result. I also got rave reviews on this one, especially for the strudel topping… yum!! Vanilla Cupcakes – this time I completely cheated… I used a cake mix from Simple Mills and the vanilla frosting I picked up at PaleoFX this year. The icing is REALLY sweet, but the cake is flavorful and satisfying. These disappeared in a flash. I hope everyone enjoyed their holiday as much as we did! Today is Mr. PaleoMarine’s (my husband E.J.’s) 50th birthday. I feel incredibly lucky to be married to this guy, not just because he’s my best friend and my favorite person in the whole world, but because it’s been so inspiring to watch him take stock of his life over the last several years and fix the things about himself he felt were broken. With the pace that the world moves around us, it’s easy to say that we’ll be better tomorrow, or to give excuses why circumstances or luck keep us from being the best version of ourselves that we can be – but it takes a lot of courage (and maybe a little healthy fear) to take an honest look in the mirror and summon the determination to change the things we don’t like. Those of you who have been following our journey here or on his blog at PaleoMarine.com no doubt have been impressed at his weight loss (over 150 lbs to date), but the actually that’s only one small part of his transformation. In addition to getting his weight under control, he has also been working out to improve his fitness, adjusted his sleep habits to ensure he’s getting enough rest, made a conscious effort to look at the world in a more positive light, improved his money management and personal savings, and makes a conscious daily effort to be the best husband, father, and friend he can be. The result has been awe inspiring, not just for me, but for many of the people that he talks to about his journey over the last couple of years. We personally know more than 20 individuals and couples who have made similar improvements in their lives as a direct result of E.J.’s story. Yes, it requires effort for both of us in equal measure to keep a good thing going, but it is so worth it. It’s amazing how one positive change affects the next and the next, and how you can look back after a while and wonder how and why you didn’t make the changes sooner. I challenge everyone, regardless of age or situation, to find the courage to take a hard look in the mirror and ask yourself, “What is one thing about yourself that you really want to change?”, and then form a plan to change it. Know that it may take years to make it completely, but every journey begins with a single step and a determination to reach the destination. Try to take someone with you if you can – the support of a friend or spouse definitely makes the journey easier, but if you have to go alone, be sure to keep a journal and or find an online community with similar goals to help support you in the moments when you want to give up. And when you fail (and you will), remember to love yourself enough to get back up, dust yourself off, and keep going. Happy 50th Birthday, E.J.! I’m so incredibly proud of you, and like a fine wine, you’re definitely getting better with age! !